Our first fatigue crack. After more than 30,000 miles of rough roads, hard driving, and plenty of other abuse, a chassis component cracked all the way through. It wasn't one of the major frame tubes, or even a tube at all. It was the 2" X 1/8" strap that helps to support the spare tire. The strap obviously started cracking some time ago, but we only recently discovered it during one of our semi-routine inspections of the frame, which we'd gotten kind of lazy about and had almost given up doing, because we never found anything wrong. Now we have. A Locost chassis has a couple of known stress points. Front fender mounts are an obvious one, as are the rear trailing link pickup brackets. Both of these, if not reinforced, will see a lot of vibration and/or bending strain, and will eventually work harden and crack. This has been demonstrated over the years in many countries with many different Locosts. Since we knew about both of these structural weaknesses beforehand, we were able to reinforce each one, and we haven't heard a peep out of either since we completed the car three years ago. We didn't know about the spare tire mount, possibly because not a lot of Locosts have spare tire mounts. But spare tires are heavy, and see a lot of bumps over 30K miles, and the two threaded rods that secure our spare tire to the 1/8" strap are long and therefore put a lot of leverage on that strap. 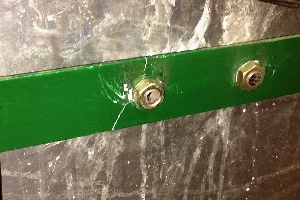 The crack occurred exactly where you'd expect it, right down the middle of one of the securing rod holes. Fortunately the other rod kept us from losing our spare tire altogether, which would've no doubt torn apart the rear bodywork and likely punched a hole in the gas tank. Before we could repair the strap we had to evaluate our options with respect to how much work we were prepared to do. It seemed apparent that the strap would have to be welded back together, but two things: 1) The strap had obviously been weakened to about the strength of peanut brittle, so welding it would only delay the inevitable, and 2) There's not a lot of space in there between the strap and the fuel tank to weld anything. We'd have to take the whole back end of the car apart, including drilling out all the rivets that secure the rear body work to the frame. It would've taken about the same amount of effort to weld in a new strap, which we wouldn't do anyway because a new strap would just fail like the old one. What we needed was something we should've used in the first place, a 2" channel. The channel would only have to be about 3/4" deep, effectively making it a lot stronger than 1/8", although exactly how much stronger is beyond our computational abilities, but feel free to figure it out on your own. For us it's enough to know that the channel wouldn't flex like a popsicle stick under the weight of the spare tire, and would therefore last forever. 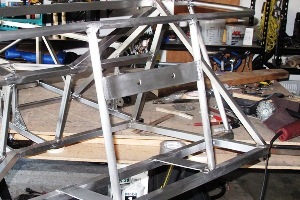 But as we noted earlier, welding anything in that area of the chassis would entail a tremendous amount of work, no doubt sidelining the car for weeks. So we went with our second option, which was to do nothing, until strangers started driving up alongside the car to let us know our spare tire was bouncing around. Not 'Wow, what kind of car is that? ', or 'Cool ride, man', like we normally get, but 'Hey, I think your spare's about to let go.' Which is how we ended up pursuing our third option, which didn't involve any welding but still required us to remove the fuel tank. We were aware, back when we first installed the fuel tank, that removing it would be impossible once the bodywork was in place. 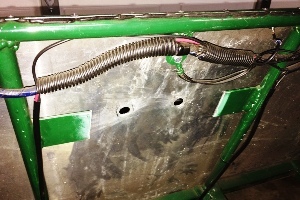 The rear flanges on the straps that secure the tank to the chassis were bolted to the frame in an area of the car that is no longer accessible. We had a theory back then that it might be possible to unbolt the front flanges first, then slide the tank forward until we could get some purchase on the rear bolts with a socket and a two-foot extension. This theory remained untested until a few days ago, when it proved to be completely false. Fortunately, that turned out not to be the end of the story. As it happens we never fully tightened those rear bolts. This wasn't so much an oversight as a design decision. 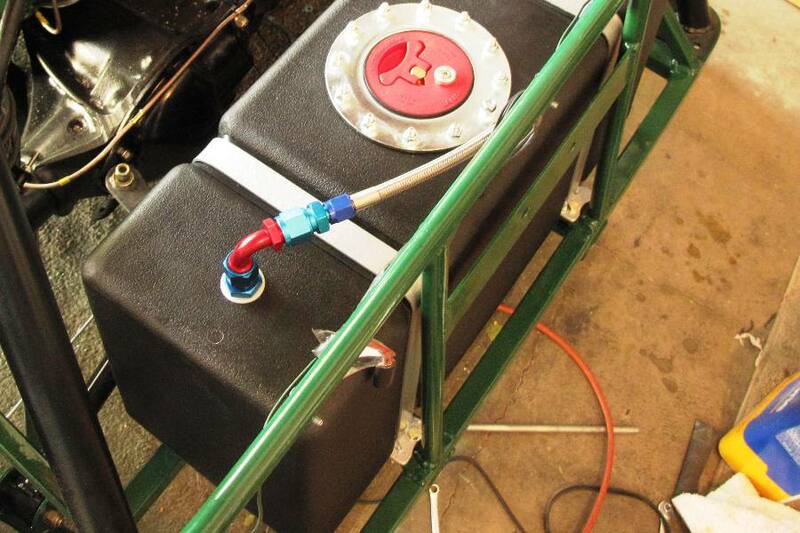 The metal straps that secure the tank have rubber cushioning strips underneath them, and the straps only need to be tightened enough to compress the cushions, thereby keeping the tank from rolling around. 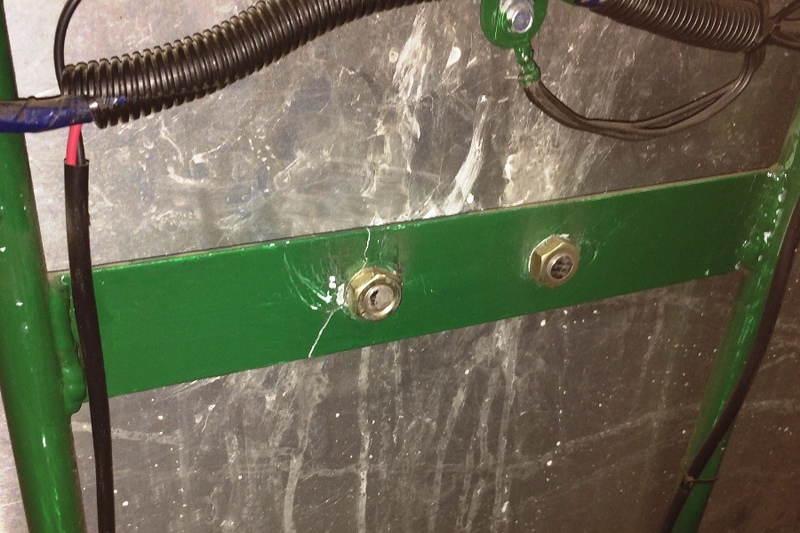 The strap bolts were under tension, just not screwed down flat. When the front bolts were removed the tension was off, and this allowed us to squeeze a couple of fingers in there from underneath and unscrew the rear bolts by hand. Access to the spare tire strap was greatly improved with the fuel tank out, but we still felt that attempts to weld anything on or about the strap would be likely to adversely affect the integrity and/or shape of our paper-thin rear body panel. So we did what we usually do, stared at the broken strap for several hours, or at least a few minutes, until it finally dawned on us that we used to fix stuff like this all the time back in the olden days, before we'd learned how to weld, but had learned how to drill. We realized we could just bolt the channel to the strap. That seemed like an outstanding plan. 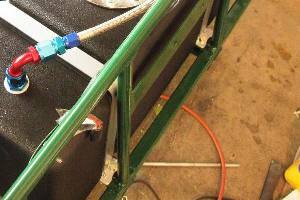 The channel would be far stiffer than the old strap, practically unbendable, and the bolts would transfer all of the spare tire stress from the channel to the last inch or two of the straps, which would be trapped in place by the channel and unable to move, and therefore have no choice but to transfer the stress directly to the chassis, which would soak it up easily with no destructive or even measurable strain, at least in theory. And unlike our fuel tank removal theory, this one actually seemed plausible. Even realistic. So we cut out most of the old strap, leaving only the ends in place, and fabricated a channel out of a 2-1/2" square 1/8" wall tube. We then drilled holes in everything and bolted the channel to the strap ends, which appeared to be strong enough to support the entire car, let alone a single spare tire. Unfortunately we couldn't leave a chunk of bare steel alone in the car to face the elements, so we had to paint it, which of course meant we had to wait for the paint to dry, so the car is not actually back together at this point, although we expect it to be shortly. In the meantime we've been working on the junior Locost. 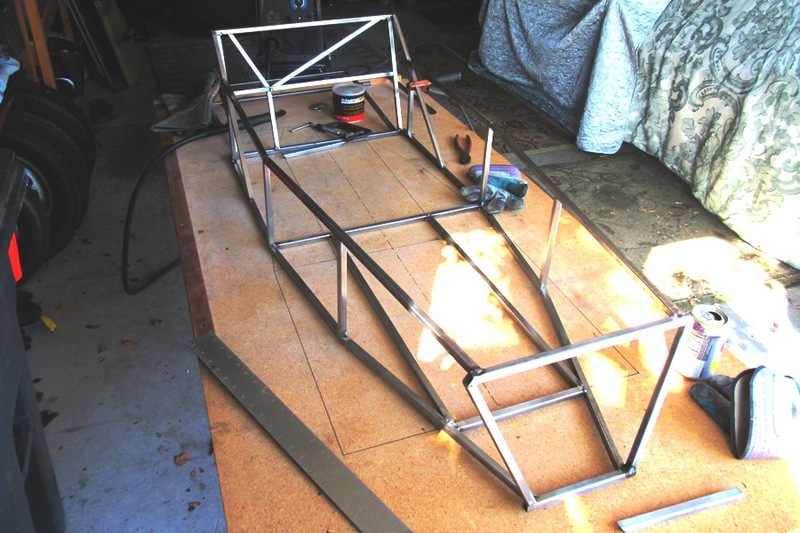 We started building the steel space frame chassis, and more than just cutting tubes, or marking tubes for cutting, we tacked together all of the bottom tubes, the nose tubes, and enough upper tubes to keep everything from falling apart. 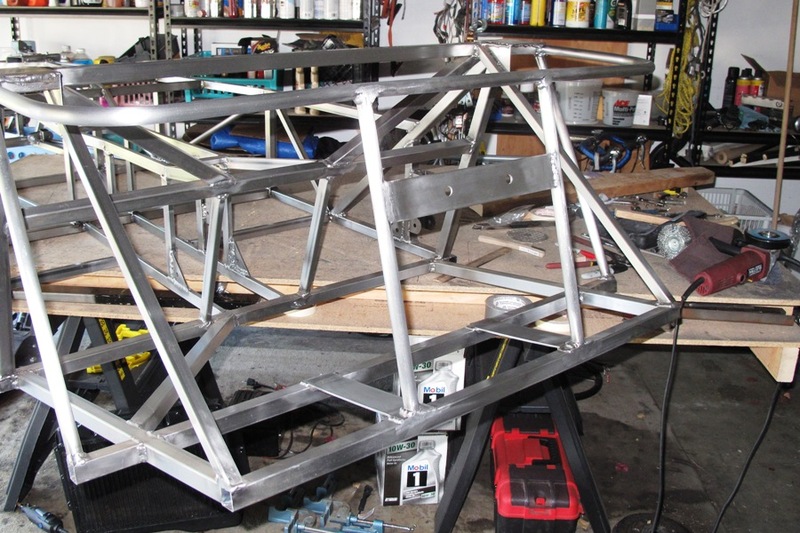 The frame is going together a lot faster than the full-scale frame, in part because it's small and mostly because we're more familiar with the welding gear. Our easily-maneuverable build table is also helping, a two-by-four foot sheet of MDF over a flimsy card table. It turns out that building a junior-scale Locost frame is child's play, so long as the child knows how to weld. The junior frame is half the size of a real one, and will be about a fourth the weight, which is heavy in scale terms but should at least be nice and strong. We made the frame 3" longer than the wooden frame so we could squeeze in a medium-sized adult, but we'll have to see how it looks after the pedals and the seats are in. The interior will be 20" wide with a 5" tunnel on the right, leaving 15" for the seat, wide enough for both of us, although not at the same time.